This has got to be the fastest I ever made a necklace! Less than a day! As always, being a little off in my timing, I discovered that the EBW challenge dead-line was rapidly approaching and I had not even thought of an idea for something to make yet...but with a theme such as "First Ladies of Style", things just seem to flow naturally and with a grand Queen in mind,- the choice was obvious: Lots of pearls, crystals and delicious silver beads! 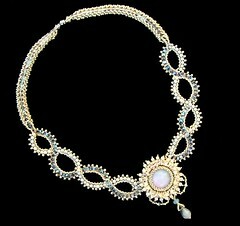 Miriam, this is a gorgeous necklace!